Thera-Gloves are lightweight, fingerless support gloves that alleviates pain without restricting movement of the hand. Made from the heaviest, most tightly woven spandex/nylon fabric for maximum compression and heat retention, these gloves enhance blood flow and massage the muscles of the hand and wrist. Ideal for people who suffer from arthritis, RSI, carpal-tunnel or general fatigue in their hands or wrists. The pocket of air in the palm of the hands reduces the build up of moisture allowing the gloves to be worn comfortably throughout the day. Thera-gloves are perfect for knitters, sewers, quilters, painters, flower arrangers, gardeners, toy and doll makers, embroiderers, cake decorators, writers, musicians, cashiers and computer operators. 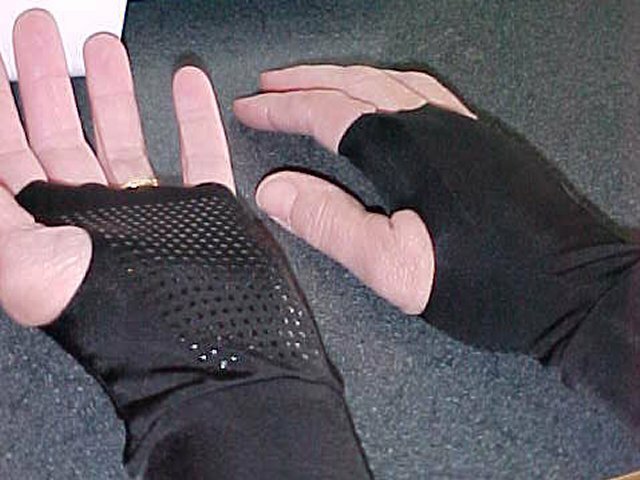 Gripper gloves (sold as a pair) have tabs on the palm of the hand to assist with holding fabrics, tools, etc. Available in beige or black. The Wrist-Wrap (sold as a single glove) provides firm support around the wrist as well as compression over the back of the hand. 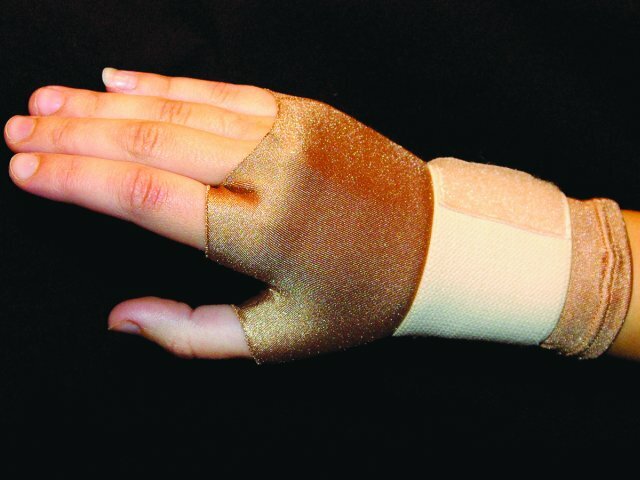 The Wrist-Wrap is able to be worn on the left or right hand. Available in beige only. Measure the size of your hand as shown in the diagram and use the table below to find your size.